Register for Complimentary Access to the Show Floor! Perfect for commercial print operations and budget conscious In-plants. RISO ComColor Series Cutsheet Inkjet Printers are the ideal complement to your current printing devices. Expand your production capabilities with affordable color inkjet. With a low “Total Cost of Ownership” in comparison to other printing devices of comparable speed and quality, RISO ComColor printers provide a shallow financial ramp into cutsheet production color inkjet. RISO, Inc., long recognized as the world leader in digital duplicators and innovator of inkjet printing technology, will be showcasing its product lines at this September’s PRINT18 in Chicago, IL September 30th through October 2nd. In addition to two lines of business inkjet and professional inkjet printers and a digital duplicator line. The company will also be showcasing the RISO T2 printer intended for the high-volume production market. The RISO ComColor GD Series of Professional Inkjet is a high-speed, full-color printer that delivers prints at speeds up to 160ppm. The GD is among the world’s fastest cut sheet inkjet printer, using 5 colors for an exceptional gray scale print quality and lower printing costs. 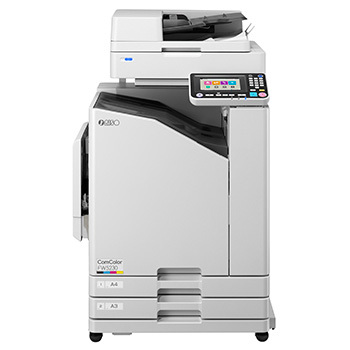 The ComColor FW series of Business Inkjet provides office environments with high speed, full color variable data printing at 120 pages per minute, as well as improved scanning, copying, and networking capabilities – all in a smaller footprint than previous models. Designed as a business inkjet device, the ComColor FW series delivers high productivity, energy efficiency and reliability. RISO’s MF series of digital duplicators is a single pass, two color digital duplicator that empowers graphic artists and print shop owners to produce high impact spot color documents quickly, easily and economically. RISO will also be showcasing the RISO T2 system at PRINT18. Shown previously as a conceptual prototype, the T2 offers a significant improvement in efficiency for production printing, reaching speeds of 300+ duplexed prints per minute. The RISO T2 answers the need for affordable cutsheet inkjet technology designed for reliable, high-quality, high-volume production print.